Scoliosis is a sideways curving of the spine that often gets started in childhood, when the bones of the spine are still growing. In many cases, the exact cause of scoliosis is unknown. 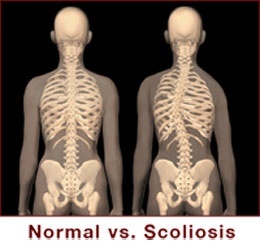 It is thought that scoliosis is the result of a hereditary problem or an adaptation to some type of trauma, such as the birth process, or an injury, such as falling off a bicycle. It usually starts with problems in the lower back. Because spinal bones continue to grow well into the early 20s, if left uncorrected, scoliosis often worsens. Unfortunately, the most common treatment approach has been to wait and see how bad it gets, resorting to unsightly braces, or eventually surgery, if it progresses too far. Bailey Chiropractic Centre of High Point, North Carolina's approach to scoliosis is to use specific spinal adjustments, often combined with corrective exercises. If detected early enough, Dr. Bailey has had excellent success with scoliosis cases. Early detection and chiropractic correction is important for optimum pain relief of scoliosis. Do you know someone who could benefit from a chiropractic examination at Bailey Chiropractic Centre of High Point, NC? Please contact us today to schedule a chiropractic examination.